There is a level of tension between what a developer wants and what the client wants. As a developer, I want to use the coolest technologies, the freshest methodologies, to be so far on the bleeding edge that they have an ER dedicated just for my team. As a client? I want to be as conservative as possible, for the most part, I don’t care for new technologies unless they have some significant feature that I can’t get anywhere else. I value speed of development over having the devs geek out. I spoke about before, the tendency of developers to start building castles in the sky in favor of getting things done. I call it Stealing From Your Client, because you are introducing additional things that aren’t necessary, won’t bring additional value or just plain make things hard. For example, in just about any project that I have seen, putting an IRepository in front of an OR/M or putting an IRepository in front of RavenDB was a mistake. It created no value and actually made things harder to use. This sort of thinking drives me bananas. (Editor note: That sounds like a very painful thing, and I am not sure why I would do that, but it appears that this is an English expression that fit this location in the post). Dictating the architecture of an application, before you even have an application? Hell, making any decisions about the application (including what technologies to use) before you actually have a good idea about what is going on is a Big No! No! Here is the most important piece of this post. For the most part, all those cool technologies that you hear about? They aren’t relevant for your scenario. And even if you are convinced that they are a perfect fit, there is a cost associated with them, which you have to consider before attempting them. Especially if this is the first time that you are using something. The really annoying part? Most people who come up with these exciting new technologies spent an inordinate amount of their time saying not how to build apps using them, but when you shouldn’t. Evans’ DDD book quite explicitly state that DDD shouldn’t be your default architecture, that it has a cost and should be carefully considered. The industry as a whole (me included) just ignored him and started to write DDD applications. Greg Young just lectured in Oredev about why you shouldn’t use CQRS. For much the same reason. At the end, we are there to provide value to the customer. Yes, it is cool to work on the newest thing on the block, but that is why you have hobby projects. You returned to explain why repository pattern is evil. Just interesting to know what are you doing when you need in your model to access another aggregate. 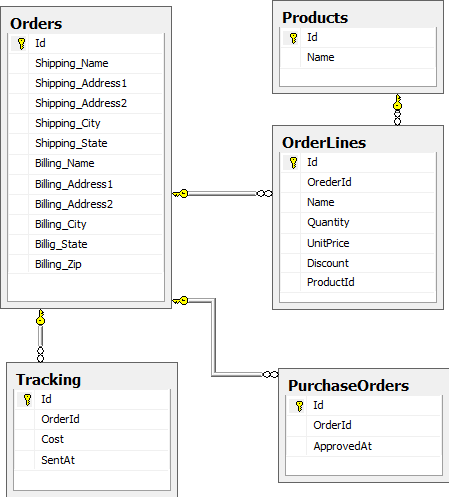 Do you reference NH from your model? I prefer to leave my model POCOed and wrap DB calls by repository pattern. Sleeping good with it. This is an interesting question. There are several ways to answer that. To start with, assuming that we are using DDD model (which the usage of a repository would imply), you don’t have references between aggregates. Here we have a business rule that states that this is required. But do we actually need a repository here? What if we just said that whoever calls us need to provide us with a way to get the birth place by date? This can be done with a simple delegate, no need to introduce a heavy weight abstraction. This is a local solution for a local problem. It keeps the database out from your entities and more importantly, it allows you to actually craft the appropriate response to this at the time of the call. …when all through the house. Not a creature was stirring, not even a mouse. Because everyone was away on a Stag/Hen weekend. Phil Jones has just notified me that a site he has been working on for a while went live. Escape Trips is a site that provides Stag and Hen trips in the UK. A Stag/Hen weekend is apparently a bigger version of a stag party, I assume that this is the origin for movies like this (well, not really). At any rate, this site is actually powered by RavenDB throughout. We actually have several videos in the pipeline of me and Phil hashing out some details about the site when it was built. The site is fast, and Phil was kind enough to give me some interesting stats. Some interesting performance stats compared to SQL Express which was running on the VPS. SQL Express was eating ~500MB of RAM (limited), RavenDB has been sat at ~80MB since launch last night! I think EF was eating CPU as well, CPU usage is way down as well. Performance comment wise, I don’t know if EF was to blame but IIS process CPU usage is down even though traffic has doubled since the launch (mainly crawlers and a new adwords campaign). After running since the launch on Thursday night, the RAM usage has increased to 100MB, still a really great number though as I plan to scale down the VPS’s RAM saving money, RavenDB will actually be paying for itself! The website looks quite simple from the public side but most of the development has gone into the private administrative website for dealing with sales, customer support and content editing. Performance wise, the system is more responsive and users are very pleased! 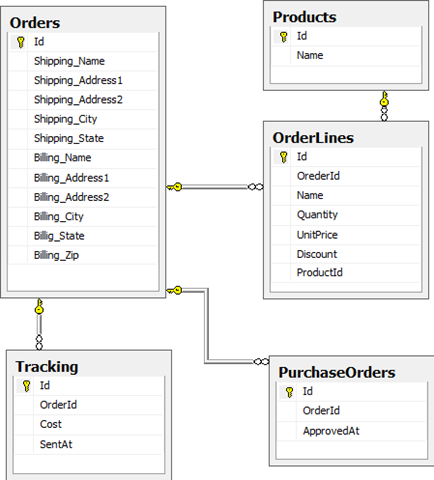 In my previous post, I showed the database schema and the UI and asked what was wrong with that. Before we move on, here is what I showed. 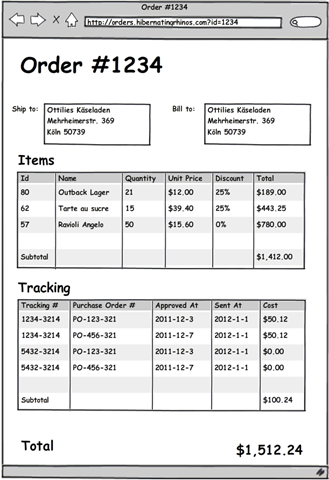 If you looked carefully, you might have noticed that there are duplicate PO# and Tracking# in the UI. More than that, we somehow double charged the customer for shipping. It is actually fairly obvious, when you think about it. 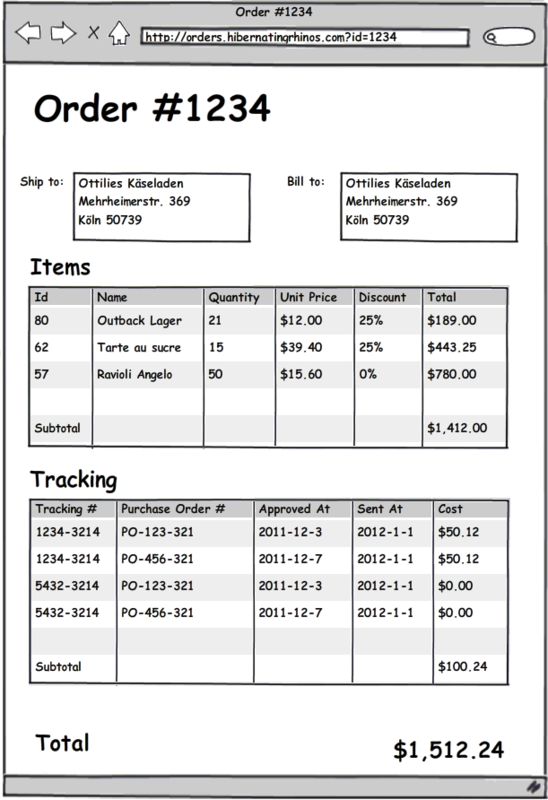 Look at the schema, there isn’t actually any association between the Tracking # and the PO #. In most orders, we have only 1 PO #, so it was easy to just add this information by just pulling it from the DB and adding a few columns. But when we got an order that has multiple POs… that is when all hell breaks lose. This is a classic Cartesian Product problem. Hints, this used to work for a long time, and suddenly it doesn’t, and the customer is pissed, annoyed and threatening to sue. We are planning of doing a lot of training on RavenDB, and I wanted to make sure that everyone is aware of it. Then there is the full 2 days workshop about RavenDB, here is the current schedule for the next few months. There is also going to be a course in the states around August, probably New York again and maybe around July in Berlin. Limit your abstractionsAnd how do you handle testing? You might have noticed a problem in the way we are named things, the names on the action and the infrastructure code do not match. What is going on? What?! You do mocking by hand and inject them like that? That is horrible! It is much easier to use a mocking framework and …. Yes, it would be, if I was trying to mocking different things all the time. But given that I have very few abstractions, it make sense to not only build this sort of infrastructure, but to also build infrastructure for those things _in the tests_. The ExecuteAction method belongs to the test infrastructure, and it setups the controller to be run under the test scenario. Which allows me to not execute the command, but to actually get it. This is important, because now what you are testing is the actual interaction. You don’t care about any of the actual dependencies, we just abstracted them out, but without creating ton of interfaces, abstractions on top of abstractions or any of that. In fact, we kept the number of abstractions to a minimum, and we can change pretty much every part of the system with very little fear of cascading change. We have similar lego pieces, all of them move together and interact with one another with complete freedom, and we don’t have to have a Abstract Factory Factory Façade Factory. What are they so important? Mostly because those methods [and similar, like Raise(event) and ExecuteLater(task)] are actually the back bone of the application. They are the infrastructure on top of which everything rests. Setup the given argument so it can run. Return the result (if there is one). I have code very much like that in production, because I know that in this system, there are actually only one or two dependencies that a command may want. There are very few other dependencies, because of the limited number of abstractions that we have. This makes things very simple to write and work with. Because we abstract away any dependency management, and because we allow only very small number of abstractions, this works very well. The amount of complexity that you have is way down, code reviewing this is very easy, because there isn’t much to review, and it all follows the same structure. The implementation of the rest are pretty much the same thing. There is just one thing left to discuss, because it kept showing up on the comments for the other posts. How do you handle testing? In this post, I intend to show how we can refactor things. I am going to do that by flattening the architecture, removing useless abstractions and creating a simpler, easier to work with system. Those are three parameters that we need, there is no need to create a model binder, custom command, etc just for this. For that matter, if you already have a model binder, why on earth do you store the date as a string, and not a date time. The framework is quite happy to do the conversion for me, and if it can’t, I can extend the infrastructure to do so. I don’t need to patch this action with date parsing code. The error handling alone sets my teeth on edge. Also, note that we have a complex type for TrackingId, which contains just a string (there is a lot of code there for IValueObject<T>, comparison, etc), all of which basically go away if you use an actual string. The same is true for UnLocode (UN Location Code, I assume), but at least this one has some validation code in it. And now we got somewhere, we actually have something there that is actually meaningful. I’ll skip going deeper, I am pretty sure that you can understand what is going on. Controllers are at the boundaries of the system, they orchestrate the entire system behavior. Note that I have no place for services or repositories in this list. That is quite intentional. Instead of going that route. As you can see, the entire architecture was collapsed into a single method. And what kind of abstractions do we have here? Well, we have the usual things from MVC, Controller, Action, parameter binding. We have the session that we are using to load data by id, and to store the newly create cargo. First, there isn’t anywhere else that needs to book a cargo. And saying “and what happen when…” flies right into a wall of people shouting YAGNI. Second, let us assume that there is such a need, to reuse the booking cargo scenario. How would we approach this? Note that the Command class also have a way to execute queries, in fact, it is the exact same way that we use when we had the code in the controller. We just moved stuff around, not really made any major change, but we can easily start using the same functionality in another location. I generally don’t like doing this because most functionality is not reused, it is specific for a particular place and scenario, but I wanted to show how you can lift some part of the code and move it to a different location, otherwise people would complain about the “lack of reuse opportunities”. On my next post I am going to talk about the Query() and ExecuteCommand() methods, and why they are so important.